Tips to offer a relevant experience to all of your website visitors. Web shops that introduced recommendations started a revolution, but custom-built recommenders remained out of reach for most organizations. 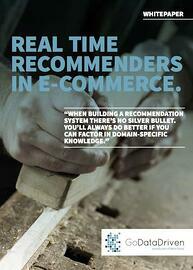 The availability of new (open-source) technology has made the realization of custom recommenders much easier. • Leap-frog by applying best-practices from organizations like Transavia and NPO.